Noni juice is sourced from the fruit of the noni tree (Morinda citrifolia) found in Tahiti, Hawaii, Southeast Asia, Australia, and India. Although noni juice has been used for centuries in traditional medicine, its use has come under scrutiny in recent years due to potential risks and unsupported health claims. Also known as the Indian mulberry, the noni tree is prized for its bark, which is used to make red and yellow dye for clothing and batik. In addition to the fruit of the noni tree, the stems, leaves, bark, and root of the noni tree are also used for medicine. Noni fruit is sometimes called cheese fruit because of its strong smell and bitter taste. It is more often used as a famine food rather than as a staple of a regional diet. Noni juice has a long history of use in native cultures, where it is believed to treat constipation, diarrhea, skin infections, and mouth sores. The leaves of the plant are also frequently applied to the skin to aid in wound healing. Noni juice is known to be rich in essential vitamins, minerals, and antioxidants (compounds that prevent free radicals from damaging cells). Noni became popular in the 1990s when the juice was heavily promoted as a health beverage. In 1992, a dehydrated form of the fruit was introduced into the United States by Herbert Moniz of Herb's Herbs, who produced both powdered and capsule supplements. Alternative practitioners have ascribed noni juice with a multitude of health benefits, including the treatment of diabetes, high blood pressure, menstrual disorders, heart disease, gastric ulcers, depression, atherosclerosis, HIV, and cancer. There is currently no evidence to support any of these claims. With that being said, several smaller studies have suggested that noni juice may beneficial to certain groups, particularly smokers and people with osteoarthritis. A 2012 study from the University of Illinois reported that drinking 29.5 to 188 milliliters of noni juice per day for 30 days significantly reduced cholesterol levels, triglycerides, and inflammation in smokers compared a placebo. The effect was seen to be greatest in heavy smokers with severe chronic inflammation (as measured by the C-reactive protein test). The findings, while promising, should suggest that noni juice can mitigate the effects of smoking or that noni juice can render similar benefits in non-smokers. Further research is needed. For its part, the American Cancer Society has debunked claims that noni has anti-cancer benefits, stating that "there is no reliable clinical evidence that noni juice is effective in preventing or treating cancer or any other disease in humans." The noni tree is often referred to as the "painkiller tree" in the Caribbean. The analgesic (pain-killing) effects are believed to be beneficial to people with osteoarthritis and other joint mobility disorders. According to a 2006 study from Nigeria, people with severe cervical spondylosis (neck arthritis) experienced a significant reduction in pain after drinking 15 milliliters of noni juice twice daily for four weeks. The study participants, who were enrolled in the study with moderate to severe pain scores of 5 to 7, reported low very moderate pain scores of 0 to 1 after four weeks of noni use. Moreover, 60 percent reported a complete relief of neck pain. Despite the promising findings, the researchers reported that participants provided physiotherapy but no noni juice also achieved a reduction in pain scores and an improvement in joint flexibility. There is some debate regarding the safety of noni juice for medical uses. While it is likely safe when consumed as a beverage, there are concerns that the overuse of noni juice or its extract may cause harm to the liver. The noni plant contains anthraquinones, compounds found to be hepatotoxic (toxic to the liver) and carcinogenic. There have been several confirmed reports of liver injury, including hepatitis and liver failure, attributed to noni consumption. The National Institutes of Health currently advises against the use of noni juice in people with liver disease, including chronic hepatitis C and hepatitis B.
Noni juice is high in potassium and should be avoided by people with kidney, heart, and liver disease as well as those taking potassium-sparing diuretics, angiotensin-converting enzyme (ACE) inhibitors, or angiotensin receptor blockers (ARBs). Doing so can lead to hyperkalemia (excessively high potassium levels). Similarly, if you have bleeding disorders or are taking blood thinners such as Coumadin (warfarin) or Plavix (clopidogrel), you should avoid using noni as it may further slow blood clotting. Noni juice is also high in sugar and should be used with caution in people with diabetes. Noni may also interact with other drugs and treatments, such as phenytoin, the liver enzyme UGT (uridine 5'-diphospho-glucuronosyltransferase), and both chemo and radiation therapy. Due to the lack of safety research, noni should not be used in pregnant women, nursing mothers, or children. There are no guidelines directing the appropriate use of noni juice. Most noni supplements are sold in doses ranging from 180 milligrams to 650 milligrams. While dosages of up to 650 milligrams per day are considered safe, opt for lower doses if you are smaller or weigh less. There is no evidence that a higher dose will deliver better results. Typically sourced from the Tahitian or Hawaiian noni fruit, noni juice is available in many health food stores, usually in pasteurized or fermented juice forms. Noni can also be found in powder, tablet, extract, or capsule form, either online or in dietary supplement stores. Noni juice and supplements are intended for short-term use only. Dietary supplements are not routinely tested for quality or safety in the United States. As a general rule of thumb, choose supplements from well-known manufacturers with an established brand presence. Try not to be swayed by health claims that may or may not be true. If buying noni juice or extract, check to see how much sugar it contains. Noni juice is naturally bitter, so the juice will usually be sweetened with sugar, agave syrup, or some other natural or artificial sweetener. 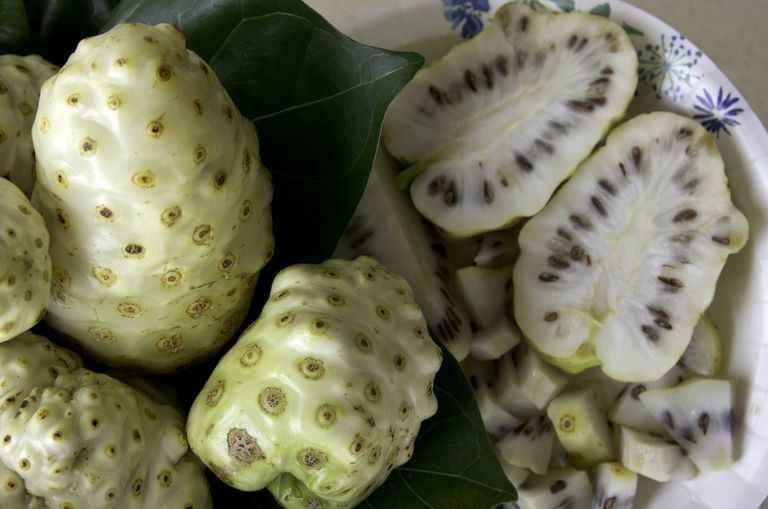 Where can you find fresh noni fruit? Unless you live in Hawaii, the Caribbean, or some other tropical region, you will unlikely find noni fruit in the produce aisle. If you do, you can peel it and eat it raw (if you can bear the bitter taste). Other people will juice it or add it to smoothies. The fruit is ripe when is slightly soft and has a slightly yellowish skin. Some people believe that fermented noni juice is inherently more healthy and will make it at home over the course of six to eight weeks. Unless you know how to properly pasteurize the fermented juice, it is best to stick with the bottled juices in stores. Akinbo, S.; Noronha, C.; Okanlawon, A. et al. Comparative study of the effect of Morinda citrifolia (Noni) with selected physiotherapy modalities in the management of patients with cervical spondylosis. Niger. J. Health Biomed. Sci. 2006;5:6-11. DOI: 10.4314/njhbs.v5i2.11590. Wang, M.; Peng, L.; Weidenbacher-Hoper, V. et al. Noni juice improves serum lipid profiles and other risk markers in cigarette smokers. Sci World J. 2012;2012:594657. DOI: 10.1100/2012/594657. West, B.; Deng, S.; Isami, F. et al. The Potential Health Benefits of Noni Juice: A Review of Human Intervention Studies. Foods. 2018 Apr; 7(4): 58. DOI: 10.3390/foods7040058.